acknowledging that the US has threatened to attack the DPRK with nuclear weapons for more than half a century. Who is a threat to global security, Kim Jong-un or Donald Trump? Read our selected articles below. Russia and China urge diplomacy to resolve a deepening crisis. They want tensions defused. 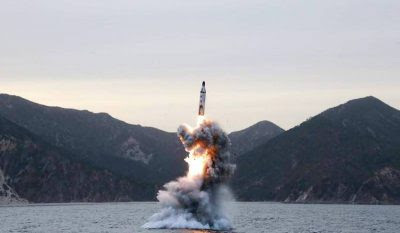 They oppose counterproductive tougher sanctions, threats and saber rattling, encouraging enhanced development of North Korea’s nuclear and ballistic missile programs. During all these visits, the North Koreans emphasized that they wanted peaceful relations with the United States and their neighbors, but were convinced that we planned a preemptive military strike against their country. They wanted a peace treaty (especially with America) to replace the ceasefire agreement that had existed since the end of the Korean War in 1953, and to end the economic sanctions that had been very damaging to them during that long interim period. Pyongyang, and much of North Korea, was leveled in the 50s by US bombings, with reportedly just one or two low-level buildings standing. After destroying and murdering in DPRK, America slapped sanctions on the country. How the people have continued, and made huge advances, is worthy of respect. This wouldn’t be the first time North Korea exaggerated its WMD credentials. Last January they exaggerated claims of a successful ‘H-bomb’ test. Despite their dodgy record, the western media, and politicians who are fed by defense contracts – are lapping up Pyongyang’s latest pig’s breakfast. What the media failed to mention was that, for the last three weeks, Japan, South Korea and the US have been engaged in large-scale joint-military drills on Hokkaido Island and in South Korea. These needlessly provocative war games are designed to simulate an invasion of North Korea and a “decapitation” operation to remove (Re: Kill) the regime. North Korea: “Annihilation”, “Massive Military Response” or Economic Warfare? Annihilation was the objective of the Korean war (1950-53). and “Mad Dog” James Mattis was responsible for the annihilation of Fallujah (Iraq) in 2004.